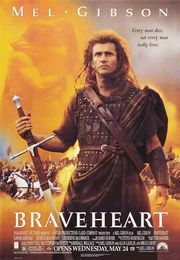 When young William Wallace’s father and older brother are killed fighting the hated English, he is taken to live with his uncle, a nationalist. When he grows up, he returns to his old village, where he falls in love with Murron, his childheart sweetheart. They marry in secret, but days later she is attacked and murdered by English soldiers. He finds and slaughters them all, then raises an army of local clans to force all the English forces to leave Scotland. English king, Edward Longshanks, isn’t very keen on that idea, and knows he needs to lure Wallace in, to break his power with the clans. He uses his weakly son’s French wife to bargain, which leads to betrayal on both sides. It wasn’t as bad as I thought it would be, though its historical accuracy is somewhat suspect. It’s overly long and rather silly at times. Not a bad film, but I do wonder what the Oscar judges were thinking when it won so many awards. This entry was posted in War Films, YearInFilm and tagged 1990s, 7/10, action, drama, dvd, usa. Bookmark the permalink.